Do people think about mythology anymore? I know that it's still taught in schools, as both of my daughters did a unit on it. Is it important to learn about these ancient stories? I think so. People love to talk about freedom of religion in this country, but they typically only want to talk about their religions. Many tend to forget that what we call mythology was the religion for ancient cultures, and they had the kind of legends and fables that we associate with other religions. And, like many religions, the stories which form the basis for mythology can make for entertaining yarns. When I say mythology, many of you are probably picturing Greek and Roman gods. But, Egypt had a rich tapestry of gods as well, which we see in action in Gods of Egypt. As Gods of Egypt opens, we learn that the Egyptian gods were real flesh and blood creatures who lived amongst the mortals, ruling over the land. They could appear as humanoids, who were about 8-feet tall, or they could morph into their more god-like appearance. Osiris (Bryan Brown) has decided that his time to rule has come to an end, and he is prepared to hand the throne over to his son, Horus (Nikolaj Coster-Waldau). But, during the coronation ceremony, Osiris' brother, Set (Gerard Butler), arrives and announces that he is tired of ruling the desert and that he deserves the crown. Set murders Osiris and takes Horus' eyes. Now in control, Set rules with an iron fist, enslaving the populace to build great temples, while Horus goes into exile. Bek (Brenton Thwaites), a young thief, decides that he wants to change the system, so, utilizing plans that his girlfriend, Zaya (Courtney Eaton), stole from her master, he breaks into Set's temple and steals one of Horus' eyes. However, during his getaway, Zaya is injured. Bek delivers Horus' eye to it's rightful owner, but he strikes a deal with the god -- He will help him get his vengeance on Set, if Horus will save Zaya. Thus begins an epic journey in which Bek and Horus will battle their way through Set's minions. 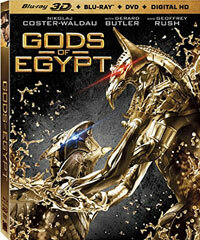 Gods of Egypt comes from Director Alex Proyas, who has had a very interesting career. After making a name for himself directing music videos, Proyas made his major motion picture debut in 1994 with The Crow. Despite disastrous set conditions -- due to Brandon Lee's death -- and the relatively obscure source material, the film was a hit and launched Proyas forward into a career which included has included some work with big stars, but he's only made four feature films between 1998 and 2009. Gods of Egypt marks his return to the screen after a seven year absence and it's easily his biggest film, in terms of scope, with I, Robot running a close second. And a big movie Gods of Egypt certainly is. The movie is wall-to-wall visual effects, huge sets, and green-screen landscapes. The opening landscapes shots show the breadth of the Egyptian skyline and this leads to one big set-piece after another. The movie is also wall-to-wall story as well. Gods of Egypt doesn't shy away from having a very convoluted plot which includes a lot of characters and some vague story-points. But, it all ties back into Egyptian mythology. Some quick research shows that Writers Matt Sazama and Burk Sharpess did their homework and weaved the legends of Horus, Set, Osiris and Ra (Geoffrey Rush) into the story, mixing in a lot of action. In this sense, Gods of Egypt plays like an Egyptian version of Clash of the Titans, as we get a smattering of different gods and monsters and a grandiose adventure. The problem with Gods of Egypt is that, while it's rarely dull and certainly reaches for lofty heights, it doesn't feel especially special. The comparison to Clash of the Titans is very apt and if you've seen any of those films -- but, especially the 1981 original -- you will find that Gods of Egypt feels familiar. The action sequences work, most notably the snake scene, but there's never any real suspense here or twists in the story. The CG is pretty good, but a few scenes look questionable and the first fight between Horus and Set looks like a video game. Still, if you are a fan of big, dumb fun, and can overlook a very thick script, you will find something to like about Gods of Egypt. Gods of Egypt made me further appreciate some Iron Maiden lyrics on Blu-ray Disc courtesy of Lionsgate. The film has been letterboxed at 2.35:1 and the Disc contains an AVC 1080p HD transfer which runs at an average of 32 Mbps. The image is very sharp and clear, showing no notable grain and no defects from the source materials. The colors look very good and the image is never overly dark or bright. The picture has a very nice crispness to it, but this clarity does hurt the seamlessness of the visual effects, making it obvious that a green-screen was in-play. The level of detail is very good and the depth works well. The Disc carries a DTS-HD Master Audio 7.1 track which runs at 48 kHz and an average of 5.5 Mbps. The track provides clear dialogue and sound effects. The stereo and surround effects are nearly constant, generated by the sounds of the fights or the desert elements. Some of these sounds are nicely detailed and very sharp. The subwoofer effects work nicely as well, adding true "oomph" to the action sequences. This set also includes a Blu-ray 3D where the MVC 1080p HD transfer runs at an average of 25/15 Mbps. The image is sharp and clear, showing no obvious grain or defects from the source materials. The 3D effects are pretty good, although I did note some doubling of objects in the background at times. The image shows good depth and there is definite separation between the characters and the background. There are very few shots which don't show depth, and this definitely looks different from the 2D version. This Disc contains the same audio track as the Blu-ray Disc. The Gods of Egypt contains an assortment of extra features. We get "Deleted Storyboards" for two scenes which run about 6 minutes. These are actually CG pre-viz scenes. "A Divine Vision: Creating a Cinematic Action Fantasy" (12 minutes) is an overall "making-of" featurette which offers concept art for the sets, landscapes, and costumes. We hear from some of the cast and creative team, and while we see Proyas at work on-set, he does not offer comments. "Of Gods and Mortals: The Cast" (11 minutes) gives an overview of the cast, and allows us to hear from the actors who talk about their characters and the production. "Transformation: Costume, Make-up & Hair" (11 minutes) allows many of the behind-the-scenes artists to show off their work and it makes the point that when shooting on a visual effects set, the costumes allow the actors to connect with their characters. We travel to the set in "On Location: Shooting in Australia" (13 minutes) to see how the large sets were constructed. "The Battle for Eternity: Stunts" (12 minutes) shows us how the fights and set-pieces were choreographed and shot. "A Window Into Another World: Visual Effects" (11 minutes) shows us how all of the sets, backgrounds, and creatures were created in the computer.